Making handmade jewelry is a fun project to take on. It’s a craft you can be proud of by showing it off with different outfits. However, if you’re new to this craft, like we all were at one point, you may not be ready to reveal your creations just yet and that’s perfectly fine. Making jewelry from scratch is a learned skill and I want to show you how to make handmade jewelry you’ll be proud to wear. Figuring out how to start making pieces that you’ll actually be proud to share can be overwhelming. Especially if you try starting from scratch. Fortunately, you don’t have to think up another design in order to improve your jewelry making skills; you can work off of what you already have. Look at the piece (or pieces) that you’ve already created and ask yourself why you chose to make this particular piece. What about the design captivated you? What style were you trying to accomplish? These questions are key to figuring out how to improve upon it because you made the particular jewelry for a reason. Don’t lose that reason – it’s what makes your homemade jewelry unique. Once you’ve figured out what you were trying to accomplish with the existing jewelry, look up other pieces that have a similar style to yours or that accomplish the design you want to achieve. Yes, your handmade jewelry should be unique to you, but don’t be fooled into thinking that successful jewelers don’t get inspiration from existing designs. When you’re learning how to make handmade jewelry, there’s no harm in taking a look at what’s trending. The best place to see what’s trending in the DIY world is Pinterest. You can get an inside look into what people love to wear, make, and eat just by looking at their boards. If you can find a pin that links to a tutorial, that would help you out even more because you would be able to learn the exact steps they took to accomplish their piece. Don’t forget that you’re still trying to create jewelry that embodies your style, so when you find a tutorial make sure that you follow the instructions, but mix up the style. 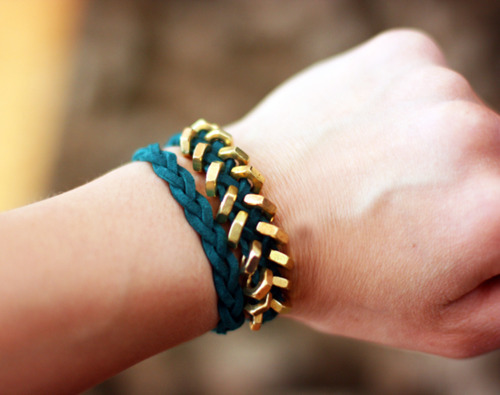 For example, Esther from whollyKao made this hexed bracelet from scratch. However, this idea wasn’t originally hers. She drew inspiration from Giles & Brothers for the design, but put her own twist to it to embody her style. If you were to recreate the hex bracelet, make sure you understand the technique Esther uses. In her tutorial, she mentions how to make this handmade jewelry by understanding how to braid. That’s it! Simple stuff, right? Unfortunately, not all jewelry making is that simple (if it was EVERYONE would be doing it). Creating wire jewelry, for instance, requires some technique that can only be achieved through consistent practice. Rena Klingenberg from Jewelry Making Journal has a video tutorial that teaches you how to make handmade jewelry with higher quality wire techniques. There are plenty of other websites that offer free jewelry making tutorials. Use those to your advantage. New to jewelry making? This is a perfect starter project. Utilize old brooches or jewelry parts to create this stunning ring. 1. With the clippers, remove any brooch backing, earring post, clip-on earring back, or jump rings on your vintage piece. Make sure there is a flat spot on the back of the vintage piece for gluing. If there isn’t one, make one with the fingernail file or sandpaper. 2. Add E-6000 glue to both the ring pad and the back of the vintage piece. Wait 10 minutes for the glue to begin curing and then put the two pieces together. For even more security, clamp or wire them together and let the glue dry overnight. By working smarter instead of harder you’re learning how to make handmade jewelry that you’ll love to wear and that others will wish they could wear. If you think jewelry making can turn into something profitable you may want to consider purchasing quality tools. The BeadSmith put together a tool kit that has everything you’ll need to get started on making your handmade jewelry. Find inspiration in your own designs and improve your technique to create a line of jewelry that will make you proud to share with the world. If you get so passionate about your craft that you become curious about selling handmade jewelry, go for it! Don’t underestimate your ability to create something beautiful.